The ReliaMed Bariatric Bed-In-A-Bag is a 50/50 cotton polyester blend bed sheet set made specifically for a bariatric size hospital bed mattress up to 52" x 80" x 12". 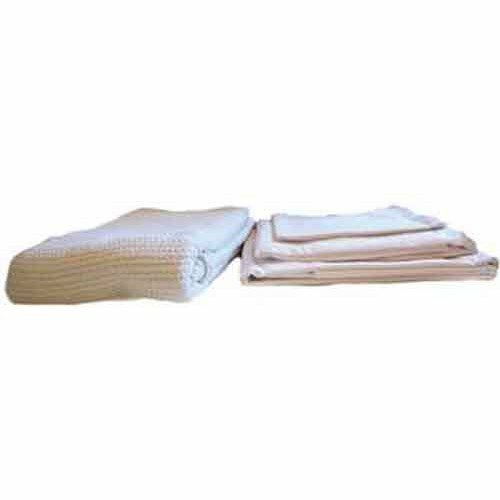 Each set includes a jersey knit fitted bottom sheet, a flat top sheet, a pillowcase, and a cotton blend thermal blanket. These cotton and poly blend jersey knit bed linens never need ironing. This fabric has a unique two-way stretch that will keep your sheets smooth and wrinkle-free. The open cell construction thermal blanket is preshrunk for long-lasting warmth and comfort. Product not as stated on web page!!!! Web page stated bottom sheet was jersey knit. What was in bag was a 180-count fitted sheet and top sheet. Called customer service, young lady said that this item no longer has the jersey knit sheet. So I returned them. I like the sheets fine, but I wish that they came in different colors besides just white. I have a couple of small dogs that sleep with me and they get hair on the bed White shows dirt faster than colors. The winter used to be cold in my bed. I have a special bed because of being sick and finding the right sheet was always hard. Now that we have this I am able to stay warm and cozy all night long. They are soft and don’t even wrinkle so they stay comfortable.